New Crop 2019 Just Arrived. A healthy alternative to white jasmine rice, with the same wonderful aroma. As shown below, this is premium quality jasmine rice has not gone through the final stage of polishing, so it still contains the outer layer of rice bran. We offer top quality Royal Umbrella brand, in the sealed airtight package as shown. A great deal for pure brown jasmine rice. 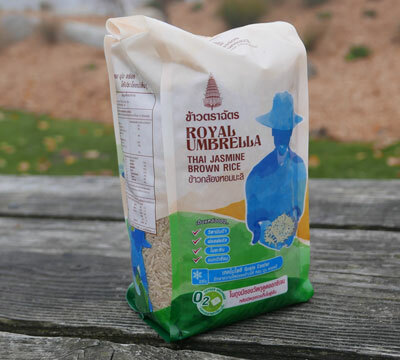 In addition to lowering cholesterol, the rice bran gives the rice a light tan color and oat-like flavor. You will need to cook it a bit longer than white jasmine rice, and add a bit more water. We like to cook brown jasmine rice and white jasmine rice together, at the same time, about 50/50 mix. This makes a nice fragrant rice that eats well. We also offer white jasmine rice, Thai sticky rice , broken rice, and red cargo rice.